Horror and comedy are the most subjective of cinematic narrative forms: what works for one viewer may not do the same for another. Now take those two and mash them together, and you’re dealing with a special kind of alchemy. The list of truly memorable horror-comedies is a small one, with SHAUN OF THE DEAD and (to a degree) AN AMERICAN WEREWOLF IN LONDON usually jockeying for the top slot. COOTIES is the latest film to enter this particular fray with tension, gore and honestly-earned laughs doled out in equal measure by a great cast of reliable pros. Clint (Elijah Wood) has returned to his hometown of Fort Chicken for his first day as a primary school substitute teacher. Still struggling with a perpetually in-development first novel, he finds himself sharing his workspace with his socially maladjusted faculty (including Alison Pill as old school-crush, Lucy ) as well as a group of children who make a good argument for elective vasectomy surgery. But wait, it gets worse. One of the students, having just ingested a tainted chicken nugget from the town’s local poultry plant (its journey from slaughterhouse to cafeteria is one of the film’s grisliest highlights, by the way) is showing signs of virulent infection, not the least of which is a violent face-biting attack on the class bully. Within minutes, the children are all turned into giggling, psychotic monsters who have their sights set on tearing the teachers to pieces like a Mini-Me version of 28 DAYS LATER. Trapped in the school, Clint and his fellow co-workers must work together to ward off the prepubescent horde and make their escape. 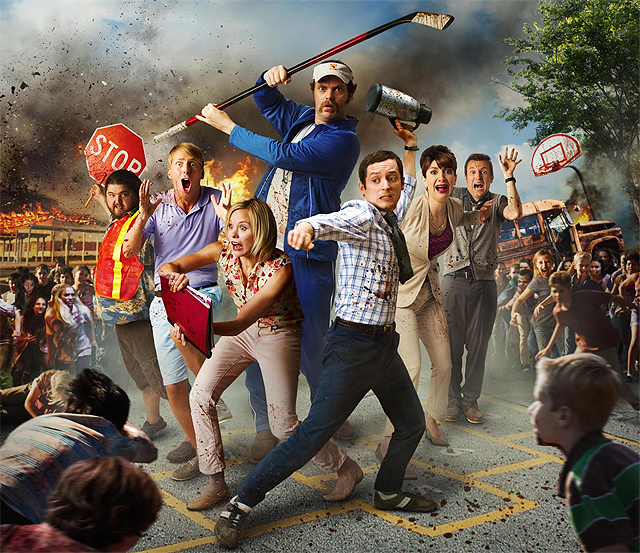 COOTIES has fun playing in the “zombie apocalypse “playground, utilizing many of the tried-and-true standards of the subgenre. The initial assault on the schoolyard, and the infighting that erupts between Clint and uber-macho PE teacher, Wade (Rainn Wilson), owe a great debt to Romero’s seminal zombie trifecta. It’s the fact that so much of the violence revolves around… well, kids. The “infected” tykes are played for straight-up scares, and they’re surprisingly effective in their gleeful savagery (Cooper Roth as infected bully, Patriot, is especially noteworthy.). They are also, in turn, dispatched in equally gruesome fashion, by way of fire extinguisher, baseball cannon, gardening shears and vehicular manslaughter. Considering the current political climate, violence & children is a raw nerve for a lot of people. If handled wrong, this all could have fallen flat on its face as soon as it left the gate but the balance between horror and laughs is in balance, making it…OK, still inappropriate at heart, sure, but not 100 percent offensive. Part of what sells COOTIES is the great chemistry of the cast. Wood, Wilson and Pill are all rock-solid as the front-and-centers of this ensemble, supported by a roster of very talented comedic actors. 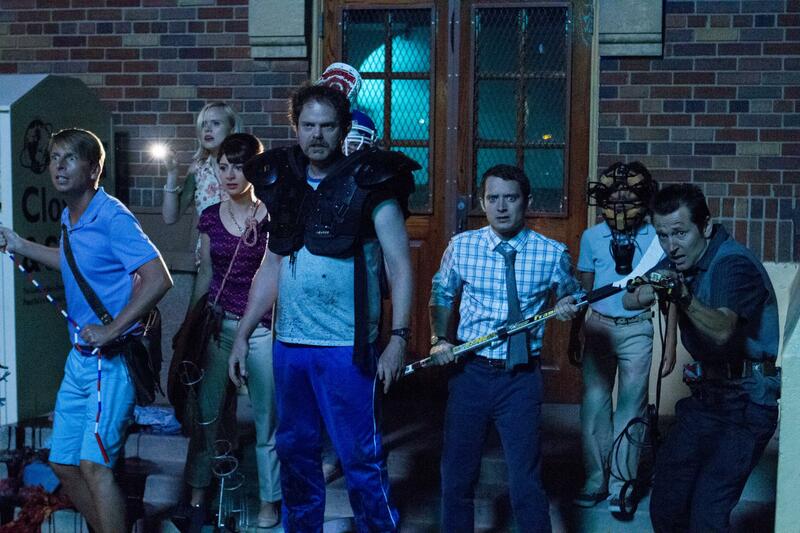 Jack McBreyer (30 Rock), Nasim Pedrad (Saturday Night Live), Jorge Garcia (LOST) and Leigh Whannell (co-writer on COOTIES, as well as SAW, INSIDIOUS and THE CONJURING) all provide great back-up. It’s Whannell, though, who inadvertently steals the show as Doug, the school’s Biology teacher. His awkward mannerisms and inappropriate conversations provide some of the film’s best laughs, which is pretty notable considering the talent he’s keeping company with. COOTIES doesn’t change the game, but it does clinch a spot as one of the better horror-comedy hybrids in recent years. It’s a gory, funny and occasionally tense take on a tale more than twice told, with energy and black humour to spare. Final Grade: A solid “A”. COOTIES is available for viewing on VOD, as well as in limited theatrical release. Check the COOTIES website for locations, dates and times.